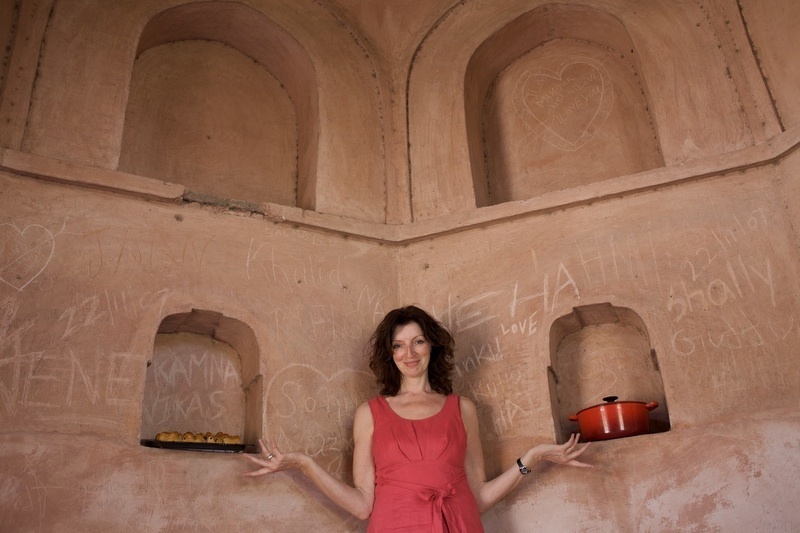 In 2005 my husband, three children and I moved to Delhi from Scotland for an adventure. We planned to stay one year but nearly 8 years on, we’re still here! I’ve always been obsessed with food and I started Eat and Dust* in 2009 as an attempt to chronicle all my Indian food adventures. What you’ll find here is a mixture of my own recipes for the food I make at home using India’s amazing larder, the recipes I create for my Mint newspaper baking column as well as a LOT of street food – especially in my favourite place Old Delhi. Sometimes I even manage to combine the two. I also set up one of Delhi’s first pop-ups – Uparwali Chai, beautiful high tea events with an Indian twist. Recently, though, most of my time has been taken up with writing a book about the food of Old Delhi and the people who make it, which should be out by the end of 2013. * For all you younger visitors, the blog’s title is a reference to Ruth Prawer Jhabvala’s book and subsequent film ‘Heat and Dust’. I am so thrilled that you have decided to share your explorations here! I am now really curious about the Anglo-Indian cuisine… what an interesting project! Many of our “hill-stations” boast established bakeries… Ellora in Dehradoon has a very rich ‘plum’ cake as well as biscuits similar to shortbread! Have you eaten/heard of the famous Shrewsbury biscuits from a bakery of the same name in Pune? If they are not shortbread what is! I look forward to watching you recreate recipes from your land using local ingredients! We will get an insight into what might be appropriate substitutions for ingredients not found easily (though times have changed and there is little that can not be sourced from the INA market!). I’m really enjoying this quest so far and certainly have a few outstanding ingredients to track down – one is lard and the other is fresh cream (not the amul type). Mind you, I’m also really enjoying discovering all the Indian food I never knew existed especially all the street food! Hope we can get together to do some eating soon. What an exciting culinary voyage! Am very envious. Do you have any plans to visit Bangladesh? Let me know if you do, I might be able to recommend a couple of places. Would love to and will definitely give you a shout – are there remnants of Britain there too? There’s quite a history of British/Christian influence in the food – The East India Company’s first foothold/HQ was in Bengal. We have a bread called pau ruti (literally “foot bread”) which is Western-style and there are loads of finger foods in the form of goodies like mutton chops and fish chops. The main influence was the ritual of tea and snacks, things like puff pastries, baked rice puddings and also chops and cutlets. Let me know when you’re there and I’ll send you the address of a fantastic Western Bakery/tearoom in Dhaka. Thoroughly enjoyed your piece in the Sunday Times. I was born and brought up in the Nilgiris, South India attending Hebron High School in Coonoor in the 1950s (ancient history). At school we had mostly British type food, famously a steamed pudding called Caleb’s Hat named after its resemblance to the headgear of one of the bearers. I also remember Malabar Pudding – sago made into a “shape” and covered in jaggery sauce-Pish pash – a children/invalid’s dish made of mixed up mince and rice and would love to hear if they are familiar to any of your Anglo Indian correspondents. Curry puffs, a favourite “short-eat”, made with puff pastry and stuffed with mince or veg curry were perhaps inspired by Scottish sausage rolls. I can’t be much help to you in your current quest but imagine any of the Raj era Clubs which still thrive – Ooty, Wellington Gymkhana etc might be a source of recipes. I have visited South India several times in fairly recent years and still found porridge widely available and the wonderful ritual of early morning “bed-tea” (a tradition I cherish into my old age) and the inclusion of Bournvita, Horlicks etc. among the beverages listed on upmarket hotel menus. Congratulations and good luck with your enterprise. Hi dear,Loved sitting & reading about food & more food,love your explorations with food in India.Speaking of the British connect-Someone has mentioned earlier though,THE KAYANI BAKERY-it is world class & Pune is proud to present it..Every trip to Pune has got me back with the most delicious sponge cake & shrewsbury biscuits..The next time you will be the lucky one to receive some of these goodies..Enjoy all the food.. Thank you Jane for your comment, I’ll certainly be trying to get round to Hebron when I get out on the road! I’m starting to wonder if I’ll live long enough to get round to all these amazing places! Hello Pamela, Thankyou for joining IndiBlogger.in. Thanks Madhavan – hope you’ll stay tuned! i really appreciate your efforts which is enlightening me too………i have seen a lot of british influence in benagali food…..the ‘sandesh’ a mithai, is much like a cheese cake……and many more you can see…….i would love to see you whenever you are in delhi. Hey Pamela, Eat and Dust is a wonderful attempt to make even a non-foodie community to get addicted to culinary. Must say, very beautifully maintained and gracefully presented entries. With you kind permission, would like to add your blog’s URL link to my blog roll. Pamela, I’ve really enjoyed reading your blogposts — especially the one on making chana bhatura and the trip to the Himalayan Sports Club. I’ve begun to tinker around in the kitchen myself and have, surprisingly enough, found it quite enjoyable so far. My mother has always maintained that Anglo-Indian food is the tastiest (alright, after Mughlai) and I think I agree. I haven’t eaten any of your dishes but if you cook as well as you write, they must be delicious. Warmly, Nina. Thanks for your comment Nina – hope you keep up the kitchen tinkering! Wengers at Delhi still make a lot of Raj Era goodies. Wonderful articles but I would request you to have channa bhutura at our home, which are excellent but do not have the bazaar touch. I have gone through your blog “Eat and Dust ” today. Your blog is an authentic,unbiased account of Delhi’s hidden food fantasies. understanding of Delhi and it’s Food Treasures. despite the heat and dust of Delhi. All the best and expect to see more from you on Delhi in the coming days. Ma’m very nice and well described old delhi’s food joints. There are many shops like shyam sweets in that area and all are famous of their own in terms of taste and purity. Next time i will be giving you some more leads for your information. It is such a pleasure having a treasure trove of information at one place. I myself have been visiting places in Old Delhi and trying to discover places to eat. The only help till now was the occasional reviews in newspapers. Now that I have your reviews, i can begin a brand new expedition with open eyes. I also feel that more people need to know that such a website exists to enlighten people. My best wishes for you. As kid I used to go the red fort every 26 Jan. to watch the Republic parade end, and the treat would be Chana Bhatura and a nice kulfi (circa 1963! ), your article(s) took me down memory lane !! Really “an inspirational blog” – I’ll say . The simple and straight forward way of explaining your experience is really wonderfull – Liked it very much . keep it up ! All the best !! Thanks Nagesh – hope you’ll re-live your own memories sometime soon! Thanks Chandan – let me know if you make any great discoveries! Ashok – looking forward to getting your leads! Mr and Mrs MAdan Mohan – What a wonderful offer – I’ll be in touch! wow thnx for awl the pain nd time. Stumbled upon your blog doing some food related searches in Google and i must say it makes an interesting read. As a budding food blogger myself i really enjoyed reading about the Indian food experience from the palate and viewpoint of a westerner. Looking forward to reading your blog on a regular basis :). as you finished your Bermi puri with aaloo subji at shyam sweets at Chawri Bazar just cross over the road to find Sudershan, selling bottled flavoured milk. What a taste! you can get lots of flavour as per your choice. If you want to change your taste bud from fried to continental you have to go to GUNJ. The place was famous for wheat,dal etc. mandi and now it turns for a good quality of sandwiches. yes you can get it with paneer layer and sprinkle of green dhania and anar danas and above all round the year no matter wheather it is a season of anar or not. Try for sweet sandwiches with honey layer there also. Discovered your blog today and found it wonderful. I wonder if you been to the St. Stephen’s College cafeteria in Delhi. I’ve yet to taste better mince cutlets and scambled eggs that were served there when I was studying there. I think both are sourced from British recipes! Read your article today in hindustan times n could’nt stop my self form reading your blog so here i am.its such a wonderfull thing your are doing something so very close to my heart.I’m a big time foodie n like to go to such places which are known for their good food. Please please let me know of the next Tea you are arranging and Farmers market. ( who organises this)? Do you live in Niz East? Then perhaps there could be a tea in the gardens here. Ivar – I haven’t ventured into St Stephen’s yet but it sounds as though it could take my British food in India project on a bit! Monica – I used to live in Niz West – do you know the necessary authorities in Niz East for a tea party? Lovleen – thank you so much! Chetan – thanks for your comment – I know just how lucky I am to be right here right now although I somehow think one lifetime won’t be enough to do justice to Indian food! I haven’t come across Anglo Indian bread pudding yet – although Shahi Tukda is pretty close – but I’m going to a new Anglo Indian restaurant tonight so maybe they’ll have it on the menu. the nizamuddin east colony association is the best contact Iam sending you a name and no. Mrs Asha Kohli the president her no. is 9810137340. Our B block garden is perfect for it. Thanks Monica – although I guess now we’ll have to wait till the weather cools down! I am a recent subscriber. You are doing a great service to the conossieurs of good and authentic food. Chetan – thanks so much! Oooh that would be so nice, I’ve heard great things about the food in Hyderabad! I write food stories for The India Today magazine and currently i am working on one that features women with a passion for food and who better than you? Please contact me on natascha.shah@intoday.com or call me on 9910435574. The sooner, the better as I am running against a very tight deadline. Here is a link to my earlier articles for your ref. A little birdie told me that you might be starting Upar Wali chai in Bangalore as well. Is that true? Please tell me it is! Thanks Natascha – lovely piece! Hello Pamela – I lived in India (Gurgaon, it’s near New Delhi) for 5 years and am now living back in The Netherlands. During my stay there I fell in love with Indian cuisine too. AND how true it is that once you’ve sampled REAL Indian food, Indian dishes in most other countries just fail so much in comparison. I do regret not being able to take food pics of the time I was there. Oh, well… on a future visit then. To palak paneer and rasmalia! To palak paneer and rasmalai! I stumbled across you via Twitter and am most intrigued by your being an Edinburgh Indian Foodie…. the same as me! I have a Cooking School teaching pan-asian food based in London, host pop-up kitchens and also have an artisan food brand (do check out the website). I am planning to be in Delhi during the last week of October and would LOVE to attend one of your uparwali chai events if there are any in the pipeline for then. If not, then if you have time perhaps a coffee in Khan Market? I have enjoyed immensely reading the article about you entitled “The Delia of old Delhi” in the Food and Travel Section of our South African Sunday Times this weekend. I have since visited your blog and find that it’s certainly one I’ll be visiting again. What a wonderful gastronomic adventure! Thank you so much for your message – I really appreciate it. Hope I’ll get to South Africa sometime too! I haven’t been to Delhi since the last 3 years. But after reading your blog I really do miss Chandni Chowk/Kareem’s/Nirula’s/Saravanabhawan,etc & not to forget the lassi. Your blog is like the lonely-planet of Delhi food. Keep up the good work. Maybe when I come to Delhi the next time around I will give you a visit. Hello Mansoor – thanks for your message – I was at Saravana Bhawan today in fact – things are definitely looking up! Krim’s is all oil, and more oil. The food swims in oil. I have tried again and again, but its oil- and, more oil. No more Karim. I just wanted to know if the Dahi [Curds served in clay glasses has compelty vanished from Daryaganj or not. In 2008, I was not able to lay my hands on one. I hope this feature of Delhi’s gastronomical delights has not become extinct. Has anyone tasted the food in Andhra & Karnataka bhavans? The food is great there & the prices are also good on your pockets. Looking forward to following your blog and trying out your recipes!! Lovely site! Just found your blog and impressed with the stuff you publishing. Subscribing to your blog and hope to see it updated regularly. This is regarding a press query from a very prestigious international magazine (India office). Could you contact on my given email id ASAP and send me your contact details (by today itself please its very very urgent coz i am running on a deadline). I can feed you with the rest of the information once you contact me. I’ve been following your blog since arriving in Delhi from Paris over the summer. As a fellow Brit (Welsh rather than Scottish), I have been inspired by your tales to try out some of the highways and byways of Delhi food. Are you still organising your pop-up teas [Uparwali Chai]? I’m involved with a group of westerners exploring lesser known parts of the city, finishing each tour with a lunch or tea – and I need to organise something in north Delhi (maybe on the Ridge) in early December. I seem to remember reading that your baking partner has departed Delhi, so maybe you don’t do this anymore, but perhaps you’d let me know if rustling up a picnic for forty people might appeal…? Thank God for you blog! Glad to read an expat’s blog that doesn’t just point out to the problems they are facing or how things aren’t the way they would like to be in India, or just random whining about daily problems they face (mostly self generated). Thanks a lot for being the sane one and writing about the life in India and not just the problems. I have been away from Delhi (my favourite city) for a long time now. I am looking forward to coming back to India, living in Delhi and reading your blog to learn about the changes Delhi seems to have gone through. Once again, thanks a lot for your blog. I happy to read your articles and in exploring your blog. I now grow my knowledge about the Anglo-Indian cuisine. Keep up the good work in doing a good service. You are doing such a fantastic job! Thqanks Pamela for giving an opportunityt for ther tradtional dshes to still remain alive!!!! For quite some time now i have been searching for people( in my office, friends ) who just love their food ( be it cooking, serving, food trips or food adventures ) as such an integral part of their own life so much that it becomes their second name and after reading the blog i feel like that you are really one of those kind, i really feel like to join such a pack whenever i see such people around. it was nice knowing you via eatanddust. I love the likes of Nigella and Kylie Kwong ( and a few others) not only because they are great chefs and crusaders for food but more so because they love, think and respect food so much that their aura makes the food and all of its components so much fun and one can clearly make out that they love their food like their own life. I will also like to ask if i can help you across this beautiful journey in any of the ways possible. Be it some food adventure / trips / cooking or be it some other food related stuff. Amazing Blog! Amazed to see your passion towards Indian food! Do give us a shout while you are in Hyderabad! HI Pam, I just found your blog (and love it) after doing a search on Indian street foods. I will be visiting India (Delhi on October 4-6) and am looking for a few safe, clean, delicious street food vendors. I have a bit of a sensitive stomach, so cleanliness is very important to me. Can you recommend such? Any other posters who can recommend any? Thanks so much! south Indian cuisine is famous for its spicy, healthy and hygienic food.I invite you with all the love from deep bottom of my heart to Hyderabad in Andhra Pradesh (south India)where I live with my mom, come along with your family, you don’t even have to waste your money in motels even, am coz am inviting you to my home, I can show you around popular places to eat and I CAN help you to experience joy of tasting three different regions of food only in one place. Harsha – that’s incredibly generous. Once I’ve finished this Old Delhi book, I’m looking forward to travelling around India more. When I’m in Hyderabad, I’ll give you a shout! Pamela I just found your website thanks to Lonely Planet. I am starting to figure out my itinerary for my December trip to Rajahstan and thought you might have a good suggestion for a part of Delhi for us to stay in. It’s my wife and I , who is south Indian. We’d love to be close to as many good eats and bazaars as possible. Besides India we have a bit more in common. We both write food blogs. Let me know if you like mine and we can link exchange. Any suggestions on how to navigate the craziness of Delhi and put as much tasty in our mouth as possible is much appreciated. 1. How is it like living in Delhi, living in India, is fun? Is it peaceful? Is it just being appreciative of everything you have? 2. Did you not find the language, the culture, the feeling of living abroad a barrier? I’m a recent subscriber of eatanddust. I really do appreciate your recepies! hi Pamela – I’m just blown away and in fax mystified by your enthusiasm for Delhi’s street food You’ve gone to corners where very few of us have dared venture…in a literal and culinary sense. More power to you! In fact, not in fax! Indian food is to spicy and very delicious…i love it.. I can totally understand that you stayed 8 years instead of 1 after experiencing the food. It is so nice that you created this blog to share your food experience in India. I must say that you have truly emancipated the city. Until I went to home page, I truly believed that the blog was written by an Indian. You have done really well. I would suggest a blog on Varanasi and its food as well. There is so much out there but it will be nice if someone of your calibre can translate it in black and white. Good luck and Keep up the good work. Hi Pamela..could you help me with your contact details…this is with regards to the review of two restaurants..
Hi Pamela! I stumbled on your blog through your column in Mint, and I must say I love it here. Or rather, I should say, this makes me comfortable. Your frank description of the chat corners in Old Delhi, gives a warm and yummy feeling. As a coffee enthusiast, I would love to know more about your project- Upparwali chai. WOW..you showed off your legs like that in front in old delhi? Isn’t that dangerous. lol. I have just read your book – ‘Korma, Kheer & Kismet’. And its absolutely awesome!! I would like to become a gastronaut too. I have always been a foodie & love travelling. 🙂 Sadly, i am just a teen now. Hopefully, i’ll lead a well-settled life to allow me to have adventures like you did. I would also like to know more about your project- Upparwali Chai. Came across your blog from http://www.ravelry.com which is devoted to yarn crafts. The post was about baking bread. Spent the entire morning and afternoon reading your various posts on your wonderful blog. This winter when I plan a trip to Delhi, I am sure to visit all the places you have mentioned. Hi Pamela, I have been devouring your book and it is pretty good. I noticed that you haven’t been to any Gurudwara till now to taste the langar. Gururdwaras and Sikhs do a lot of community service and have these kitchens which serve free food to one and all. Even though the food is quite simple in nature it is heavenly, might be due God’s presence all around :-). The Prasad is a super rich sweet halwa and is known as Kada Prasad and is the best halwa you ll ever have. I recommend you visit a big Gurudwara and take part in the preparation and serving of the food and then partake in the food itself. I believe you will find the experience quite enriching. Hi Sandeep. Glad you enjoyed the book. Actually I have been to a couple of gurudwaras, in Old Delhi and elsewhere. But you’re right. it’s a terrible oversight that I haven’t written about the experience on my blog! Very nice and thanks to share with us all of your stuff and amazing experiences you have in Delhi. Thank you so much for such a lovely memoir of Old Delhi. I hardly know Delhi, three visits in my life, being from Bombay Pune and Goa. My last visit, I wandered happily around Chandini Chowk with a friend who was born there. I ate as much chaat as I possibly could. Unfortunately I had left your newly purchased book behind in my haste. But thank you, I have so much to look forward to next time. I’m savouring every page and am reluctant to finish reading! So happy that you have loved such a truly Indian part of India! Happy eating and writing! Thank you Radhika for the lovely comment! Hi Pamela, can i please get your email i.d? I might never understand. It kind of feels too complex and very broad for me. I am a student studying in a hospitality school in Switzerland, completing my dissertation on “Exploring Culinary Tourism: through he lens of food and travel bloggers”. I am wondering if you would be willing to answer a few questions for me in the mid of February.. If yes, could I please ask you to email me.. Any sort of help would be highly appreciated. Please do let me know! Thanks a ton! PS: Your Blog on India is super fascinating (even though i m Indian myself)..!! Thanks for your guidence, I just started a food blog on blogger and now switching to wordpress. I found this page while searching how to select a good theme. Unfortunately I have already purchased godaddy hosting but i try other one. Dear Pamela, I’m just going through Your lovely book”Korma,Kheer&Kismet”. Am very impressed with the way You express. In fact more than Your recipes is the narrative. I am the EVP Human Resources of ITC Hotels. Don’t know whether you know our Corporate Chef Manjit Gill. Will love to meet up . We Deliver. We send you fresh, high quality ingredients, packaged hygienically in exact quantities required. CakePlusGift offers fresh and custom cakes, flowers, gifts for the same day, immediate and midnight delivery in Hyderabad. Wonderful information i think it will definitely benefit me. Thanks for sharing this post and Impressive site you have thank you all.Popular telangana recipes & Hhyderabadi recipes tasty in the biryani handi & chicken curry in telangana style is awesome.